Finally getting around to another review! This blog has been quiet recently due to intense studying for my boards (which I passed!!!) and now I am officially a licensed Doctor of Physical Therapy! 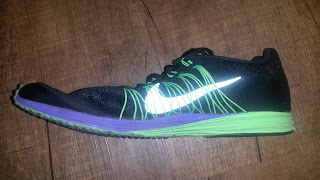 I have run through several shoes that I will be reviewing soon, but I have to start out with the Nike Lunarspider R6. Why? Because I love Japanese racing flats. There is something very special about them. They tend to be much more aggressive the US racing shoes. I have run and raced in the Adidas Takumi Sen and Ren in versions 2 and 3 of both (just recently grabbed a pair of the original Takumi Sen on ebay. They are amazing). I have tried several Asics Japan shoes (available via Running Warehouse) but never kept them due to the fact that Asics shoes do not seem to agree with my mechanics. All of those just had the feel of very serious racing shoes. So of course the next step (being from Oregon) was to try the Nike Japan Racing shoes. The first set I was well aware of was the Lunarspider series. 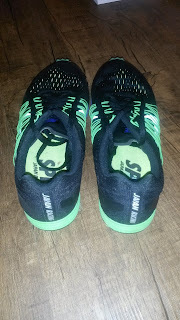 I had missed out on the Lunarspeed Lite +2, a light stability distance racing shoe and the Lunarspider LT 2, a lightweight trainer/long distance racer. The Lunarspider R series I was well aware of as several of the series had been available in limited quantities in the US. 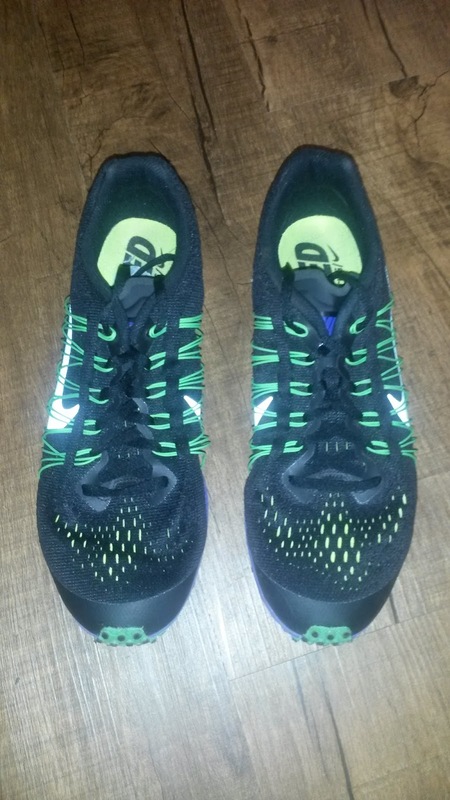 I tried version 4 on but did not end up buying them as I was convinced at that time that I had to have the lightest possible racing shoe to run fast (i.e. idiot). I happened upon a new pair on ebay for $40 and immediately jumped to grab them. Now after a couple months of having them, what are my thoughts? Let's talk about that. As the Lunarspider R6 is a racing flat, they have an expected 4-6mm drop (I cannot find exact measurements but previous versions were listed around 5mm). The midsole is full length lunarlon with a plastic plate that extends from the lateral heel to the medial forefoot. I can actually feel the plate and the pop in the forefoot is great. This is an aspect I have loved from many Japanese racers including the Takumi Sen/Ren 2 and the Asics Tartherzeal series. The propulsion plates are awesome and do make the shoes feel faster. 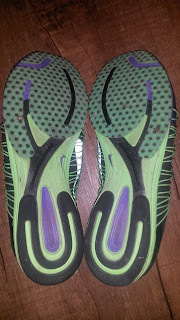 They feel like track spikes for the road and on the track I have run a 4:47 mile in them (during a workout). However, this propulsive plate in the Lunarspider R6 is muted by the soft lunar midsole, which feels a bit unstable. The forefoot is firmer with the plate and thinner midsole, but the heel is fairly soft. If you have very neutral and stable feet, I'm sure this will not be an issue for you and you will most likely find these to be very responsive and relatively cushioned (for a racing flat) racers. Since I am still working on my ankle stability, I found the Lunarspider R6 to be a bit unstable in the posterior aspect of the shoe due to the above reasons. I also found the soft heel and firm forefoot to be a bit odd as I personally like consistency in sole feel. I understand the Hoka Tracer has a similar set up and those looking for a lower profile version of the shoe may want to check the Lunarspider R6 out. There is BRS 1000 rubber in the heel, which has been extremely durable with little signs of wear after +25 very aggressive miles. The nubs in forefoot however are not super durable. After 25 miles I've already had 1-2 come off on my left shoe. While I understand these are racing flats and durability is sacrificed for weight, having those come off so early is a bit concerning. I should note that I tend to be VERY hard on my shoes (especially on my left side due to some biomechical and loading issues on that side). The nubs do provide fantastic grip on a variety of surfaces and I have not had any slipping issues even on wet pavement. Similar to the Nike Streak LT 2 and 3, the midfoot is fairly narrow but unlike the prior shoes I mentioned has a very low arch. So for those irritated by the high insole arch of the Streak series, you may want to take a look at the Lunarspider R6. Although breathable, the upper on the Lunarspider R6 is fairly thick. While the nubs on the sole have questionable durability, the upper has had absolutely no signs of wear and I would expect it to last for some time. While it is thick, the upper is breathable thanks to holes in the mesh which allow the foot to breath (I can usually see my socks through the upper). There is a stiffer heel cup that attempts to keep the heel in place and I have not had any sliding or heel lift in this shoe while training. The heel cup does come up about 2/3 of the way and there is extra cushion at the top of the upper aspect of the heel which makes it continue to feel soft. For those with Haglund deformities (aka pump bumps), you will not likely be irritated by this shoe but I would definitely be cautious as usual (take a look at the Streak 6 or Streak LT 3 which do not have heel cups). Sizing wise the Lunarspider R6 fits true to size due to thick toe guard but the overall shoe feels long. The forefoot extends to a point beyond where the foot sits, which can feel a little odd. If you are between sizes, I would go down a 1/2 size. I almost wish I'd gotten a Mens 9.5 instead of my size 10. The nice thing about the Japanese sizing is that the forefoot is fairly wide for a racing flat. I never once felt like my toes were being constricted, especially with the flexible upper. What is a little frusterating about this shoe is that the laces are extremely long (and I have tripped and eaten the pavement on more than one workout because I forgot to tuck them in) and there is no extra eyelet to perform my go-to lace locking technique. This seems to have been a problem with some Nike shoes recently and I am about to cut my own extra eyelets with a drill. The external Flywire does do a good job of keeping the foot in place, but I would still prefer that last eyelet (especially with the longer laces). If you have an extremely thin heel, you may want to consider cutting your own last eyelet holes. If I do eventually do that I will post a photo. As I mentioned earlier, the extended midfoot plate into the medial forefoot feels fast, but the softness of the lunarlon especially in the heel slows the shoe down. This will work fine if you have very neutral mechanics and will actually be somewhat protective over long distances. The weight feels heavier, maybe in the high 6 ounce range (I have not measured them myself), likely due to the thicker upper and especially in the heel cup. It is really interesting to experience the meeting of minimal racing flat with cushion (again a relative term. This is not a Nike Vomero or Adidas Ultra Boost by any means. It is still a racing flat). This reminds me of the other classic low riding Japanese racing shoes that they seem to enjoy even running marathons in. I would take the Streak 6 any day for longer races, but the Takumi Sen, Lunarspider R and Asics Sortie series are similar low riding shoes that in the US would be considered 5k-HM at most, yet are classic marathon racers in Japan. So could you run a marathon in this shoe? If you train for it and can handle that type of shoe for 26.2 miles sure. I definitely would not and would use either the Nike Streak 6 or Zoom Speed Rival 5 (another Japanese racer I will be reviewing soon). I've discussed how midsole softness affects the stability of a shoe. Obviously a softer shoe is more unstable (think walking on a soft mattress) vs a firmer shoe will be more stable (walking on concrete). This is something I discuss fairly frequently but what is more interesting to me is how this shoe is a little long. Not fit wise but the extension beyond where the foot sits where the shoe comes to a point. This is fairly subtle and won't cause an issue for most, but I have seen a few shoes like this that extend a good bit beyond where the foot sits. What happens with a longer shoe? Not only does that increase your risk for tripping as the body may not know how far the foot now extends via the shoe (because your prioprioceptive sense does not extend that far beyond where your foot is), but also because it creates a longer lever arm that the body has to move and progress over. If an individual has a great deal of calf strength, you can somewhat use this to create more force during push-off. For the majority of people running, this may create some problems because almost every runner I either treat or meet has extremely tight calves (stretching the right muscles after running is important! You lose flexibily fast as you age!). So a longer shoe will put early stress on the calves. Normally you need good calf length so that during the gait cycle, specifically midstance to terminal stance, you can get your foot behind you to appropriately generate forces in the posterior direction pushing you forward. This occurs when the foot is behind you, then your heel lifts off the ground and your calves can generate force posterior (gastrocsoleus peak activation starts before that and travels into terminal stance). If your calves are tight, you will run out of length before you hit terminal stance and instead of getting your foot behind you, your heel will begin to rise under you. So instead of pushing yourself forward, more force will be generated downward, causing a bounce. That's wasted force moving you up and down in stead of forward. A longer shoe creates a longer lever arm, which means unless you have really good calf length, the you will hit that calf length a little early. If you have good calf strength and length this shoe will be fine. For those with tight calves this may not be the best shoe for you due to the softer heel (more compression and thus lower drop) as well as the longer shoe length which may cause early heel rise during terminal or even midstance (thus more vertical than horizontal force generation). While I have enjoyed doing workouts in the Lunarspider R6 and think it is a great shoe, it just happens to not be exactly the shoe for me. It looks fantastic (and there are some awesome other colorways), but the softer midsole (again relative for a racing flat) and heavier upper would do better for someone looking for a long distance low slung racing shoe. I personally would choose the Streak 6 because I love the 6.5oz weight, light upper, 8mm drop and thick propulsive plate in the midfoot and have found that shoe to be my go to shoe not only for workouts but races from 5k to half marathon (and beyond but I don't plan on running any marathons soon). 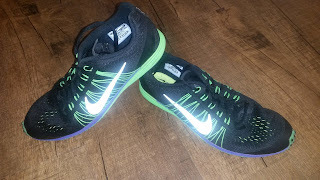 The Lunarspider R6 is a fast, low drop, cushioned racing flat that for those with stable and neutral mechanics will be able to use in a variety of distances from 5k even up to the marathon like the Japanese do. I personally would stick to 5k-10k for this shoe but it can be used for longer. These shoes were purchased new on ebay for $40. They are currently not available in the US and MSRP seems to be >$100 elsewhere (Global Rakuten). I put at least 75 miles on every pair of shoes before I review them (except racing flats which I put on at least 25 miles). Currently I have 26 miles on my pair.